This book landed in my mailbox one afternoon, not via a publishing company in exchange for a review as is typical, but by a dear friend who was so moved by it’s content. The message of this book is as powerful and inspiring as the true story of the author’s survival. Through a tragedy I cannot relate to even through my worst nightmares, John O’Leary’s life defines radical better than any dictionary. Burned terribly as a child, this book is the story of his survival, and the lessons he learned along the way. The pages of this book pushed me to think past what I know to be possible by considering what one boy did to prove the impossible. Through the remarkable people placed purposefully in John’s life, and his sheer will to live, he far more than just survived his personal tragedy. I, like my friend, could not put this book down. “I changed me,” I remember her saying. After turning the last page, my walk into my daily life shifted a little more to a radical perspective. I was definitely influenced and moved by this remarkable true story. O’Leary’s passion, faith, and zest for life jump off of the pages. He is to be commended, not only for finding the will to survive, but turning to help others live life and find hope by sharing his story. It’s difficult to share the parts of life that have scarred us. He could have easily closed the door to painful memories. Instead, he allows us an intimate look into what it took for him to survive, and how it led to his unlocking of how to live a radical life. I highly recommend this book, even though the details of the horrifying accident O’Leary endured are almost too hard to read, at times. This book will make it’s readers grateful for life, and ready to live …radically. 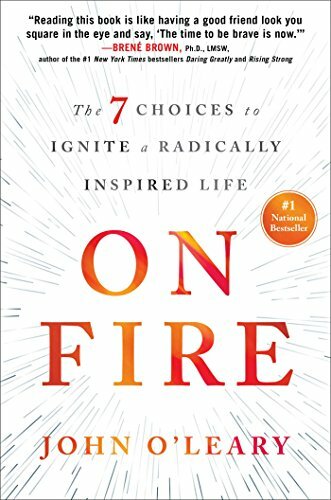 Click here to purchase “On Fire,” by John O’Leary.